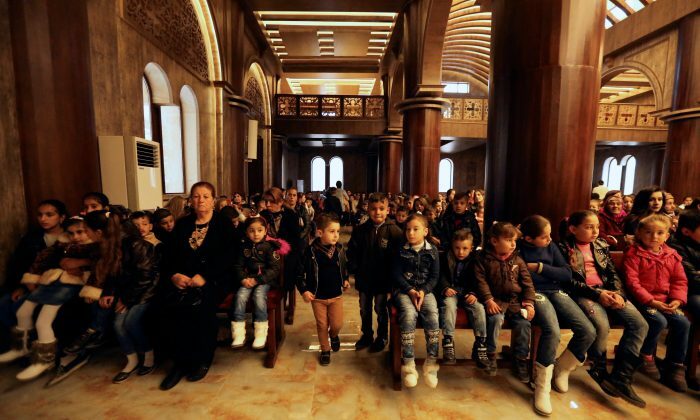 TELESKOF, Iraq–Inside the newly renovated Church of Saint George in the Northern Iraqi town of Teleskof, Hayat Chamoun Daoud led children while dressed as Santa Claus and singing “Jingle Bells” in Aramaic. Like every other resident of Teleskof, this was Daoud’s first Christmas back home in three years, since ISIS terrorists overran her town and forcibly displaced its 12,000-strong Chaldean Christian community. Faced with a choice to convert to Islam, pay a tax or die, Daoud, like many other Christians in the Nineveh Plains, chose to flee. Most sought refuge in nearby towns and cities, but many sought permanent asylum abroad. Though the terrorists were only in Teleskof for a few days, residents only began returning home earlier this year. 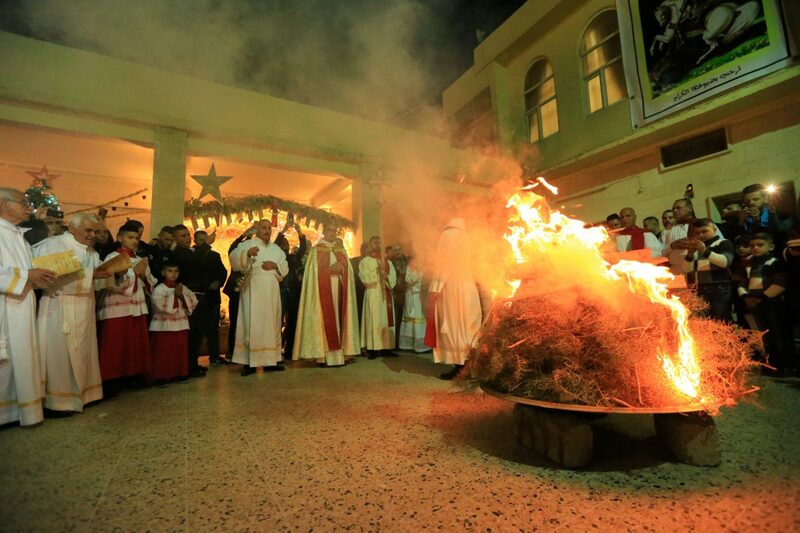 Despite the obvious joys of being able to celebrate openly once again, it was a bittersweet Christmas for most across the Nineveh Plains, the epicenter of Iraq’s ancient Christian communities which can trace their history in the country back two millennia. Though Iraq declared full victory over the terrorists just two weeks ago after a brutal three-year war, the damage done to Christian enclaves was extensive, and left many wondering whether they could overcome their recent history. ISIS ravaged Christian areas, looting and burning down homes and churches, stripping them of all valuable artifacts and smashing relics. The damage in Qaraqosh, a town 10 miles west of Mosul also known as Hamdaniya, was extensive, particularly to the town’s ancient churches. 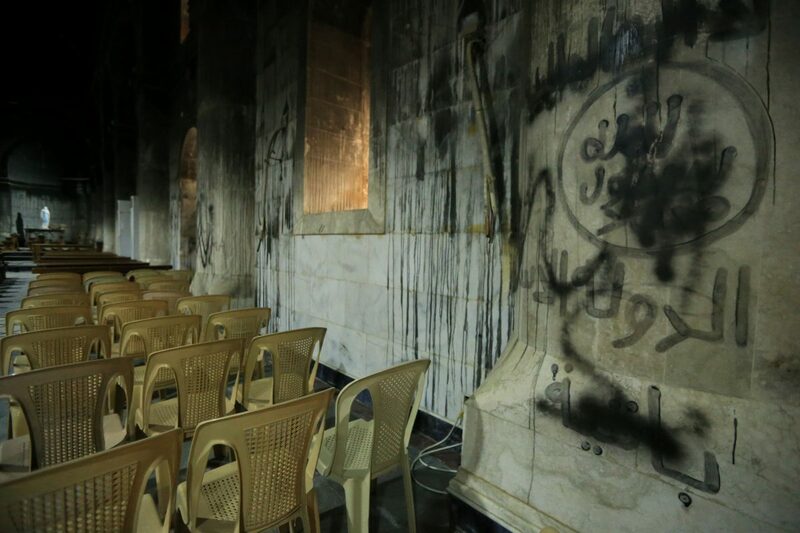 At the Syrian Catholic Church of the Immaculate, congregants gathered for midnight Mass on Sunday surrounded by scorched and blackened walls, still tagged with ISIS graffiti. They also sat on donated plastic chairs – the church has not yet been able to replace the wooden pews the terrorists used to fuel the massive fire which engulfed the church. Before the ISIS onslaught, Qaraqosh was the largest Christian settlement in Iraq, with a population of more than 50,000. But today, only a few hundred families have returned. Entire congregations have moved overseas, such as the Syriac Orthodox congregation of the Church of Mart Shmony. On Saturday afternoon, Father Butros Kappa, the head of Qaraqosh’s Church of the Immaculate was trying hard to summon any sense of hope to deliver his congregation during Christmas Mass.